Hey guys! Thanks so much for the encouragement yesterday. I woke up this morning feeling…better! Randomly. Finally. And so did this 40-minute workout from POPSUGAR. WOW. Feeling it today. Don’t get me wrong: I’m still deeply, deeply anti-winter. Still fantasizing about vacations. Still feeling sorry for myself that I “have” to live here. But it snowed again this morning and…I somehow kept my cool. This too will pass, right? If you’re in the same boat, check out the comments on my post yesterday. Some great ideas! Or at the very least, helpful camaraderie. Winter haters unite! 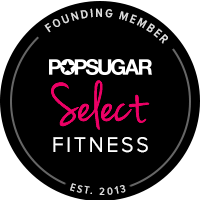 Back to the POPSUGAR thing: I’ve been loving their workouts lately, especially the ones by Anna Renderer. <– That link takes you to a huge library of her videos, check ’em out! POPSUGAR has also introduced me to some crazy new moves. Have you ever heard of a straight-arm push-up? It’s exactly what it sounds like, as weird as that seems. Basically, you get in a plank position and lift and lower your body a few inches using just your shoulders, keeping your arms ramrod straight the whole time. I was pretty sure I was going to pop something out of its socket the first time I tried it. Another move I learned is the single-arm burpee. I know, WHAT? Because regular burpees aren’t hard enough, of course. My initial reaction was pure skepticism–is that even possible?? Despite those two questionable moves, I’ve been loving the PS style so much that I was inspired to borrow a few moves for my next workout. Check it out, and if you like what you see here, you could just be the next Anna devotee. Plank to down dogs: Start in a plank position and move into downward dog without moving your hands or feet. Slowly return to plank, hold briefly, and repeat. Atomic crunches: Lay down flat, arms overhead. Lift up into a crunch while simultaneously pulling your legs in to your chest. Lower and repeat. Side hip drop and kick: Kneel on the floor and then prop yourself up on one side with a straight arm. Lower your hips to the floor and then raise them as high as they can go. At the top, release the top leg in a strong kick. Lower again and repeat. Backwards lunges with 10-sec pulsing sets at bottom: Step one foot way out behind you in a backwards lunge and then squat down into the lunge. When you’re as low as you can go, pulse slowly for 10 seconds. Rise up for a breather, and then go back down for another set of pulses. Repeat. Push-ups with pikes: (Different than a pike push-up!) Do a regular push-up, then quickly jump your feet in towards your hands until you’re in a pike (upside-down V) position. Jump back out and do another push-up. Repeat. Plank w/opposite arm/leg lifts: (Anna called this a superman but I think of that as something completely different…) Start in plank position. Keeping your torso as steady as possible and parallel to the floor, slowly lift one arm and the opposite leg at the same time. Lower and repeat with the other arm/leg. Keep going, focusing on core strength for balance. Curtsy squats: Standing, slide one leg behind the other and several feet away from the body. Keeping knees and toes aligned, squat down. Repeat on other side. Gate swings: With feet pointing slightly out, drop into a deep squat, hands on knees. Then spring up to standing. Repeat. Jumping jacks: Oh, ya know. Those. Any variation you like! Duck to high kick: In a slight squat position, duck down as you sweep your body over to one side. Rise up and do a high kick in the opposite direction. Duck down and slide to the other side and repeat the kick, this time aiming it in the direction you just came from. Repeat. Burpees: Any variation you like, double-armed or single, if you dare! Jumping oblique twists: Stand. Keeping body in one straight line, use arms to twist from side to side in a semicircle, forcing the upper and lower body in opposite directions. I do still want winter and teething to go away. I’d love for warmth and sleep to come back!! haha. I’m in a bad, bad cycle. I’m tired from sleepless nights so I don’t get much accomplished around the house, and this keeps on going. I need a maid, even though I’m home all day. Worst stay-at-home-mom EVER!! Hey it’s tough!! People think you have all this free time but somehow you just DON’T. Looks like a great workout. I love that you give descriptions of the moves!! You mean like my description of jumping jacks? haha. The first time I tried 1 armed burpees I about killed myself – it was not fun. It does get a little (very little) easier! ooohh you have my interest piqued for tomorrow!